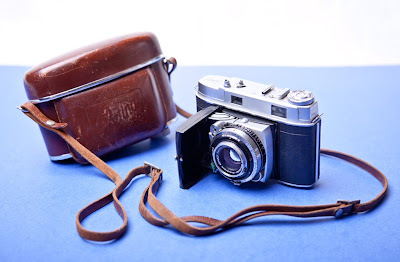 The next camera in this series is this Kodak Retina IIc. It's an incredibly solid little camera; the weight for it's size and the feel of all the mechanisms scream craftsmanship. The leather case is built such that it could probably survive years of hard abuse and still provide superb protection for the camera. The Retina line was manufactured in Stuttgart, Germany for Kodak by their subsidiary Nagel Camerawerk. The original Retina was introduced in 1934 and pioneered the 35mm film format. The Retina IIc shown above was produced between 1954 and 1957. Like the other Retina II series cameras preceding it, it has a rangefinder viewfinder, an exposure calculator and interchangeable lenses. The exposure calculator is an interesting feature, apparently introduced on the second generation Retina I model. The user sets the "light value" which locks in a ratio between shutter speed and f/stop. A ring can then be rotated that allows the shutter speed or f/stop to be adjusted that keeps the other in sync for proper exposure. It's basically a mechanical version of the aperture value and time value modes on current DSLRs. Shutter speeds are bulb mode or between 1 and 1/500th second, and the flash can sync at any speed. There's a 10 second self-timer. The standard 50mm lens is f/2.8 and is reputed to be a very good lens. Close-up adapters, wide angle (35mm f/5.6) and telephoto (80mm f/4) lenses were also available along with quite a few other accessories, including a microscope adaptor. This camera has no personal history; my Dad could not remember how it showed up in his collection. But its solid feel and the exposure computer caught my attention and drew me to it. It should be fun to give it a try.